In my home Easter is a fun time! My children always request Easter egg decorating as an activity this time of year. 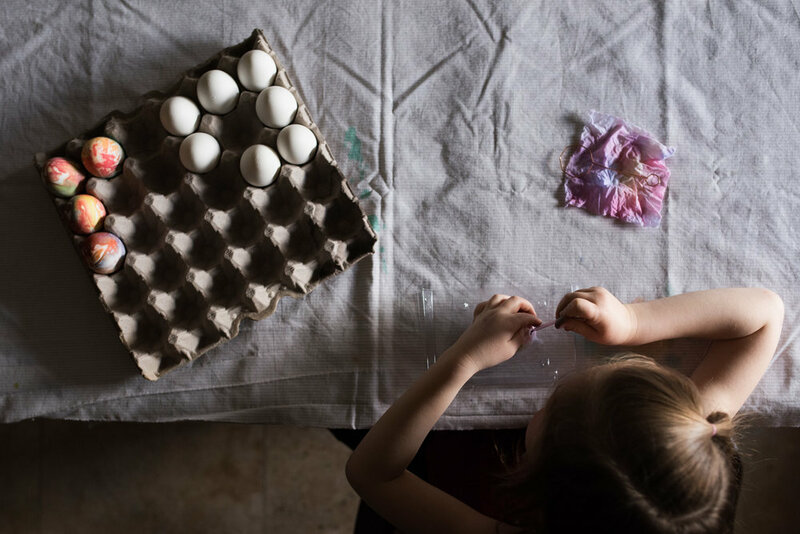 They literally sit for hours perfecting their egg masterpieces while I snap images on my camera. After awhile though I begin to realize I’ve taken the same image over and over again just with a different egg. Ha, ha! Okay, I better mix things up! In situations like this where my children are still and engaged in an activity I like to add variety to my images by changing my perspective. This allows me to get several different captures out of a single photo shoot. This is certainly the most traditional perspective when capturing an image. This straight on, at eye level, capture is a must have. You can also try for variety in this perspective by capturing different facial expressions and maybe an image or two with eye contact as well. I really love this point of view. This is certainly a perspective that us parents can all relate to as we often view our children from this view point. Whenever I see images captured from above a child I find I’m filled with that parental feeling of nurturing. One way you can add variety within this perspective is to capture the bird’s eye view point from in front of but also from behind your subject. Details are beautiful but so easily overlooked. I am making a more conscious effort to capture the details around me. You can certainly vary how you capture your details as well and use various different perspectives. Also, don’t be afraid to shoot at a wide aperture which will draw attention to your subject and blur out your background. There! All done! Now I have at least 4 or more Instagram worthy images ready to be posted! That sounds like a win in my books! Happy Easter friends! I hope you have some fun and relaxation planned with your family! Ahhh! Lens flare! I happen to adore all that dreamy haze, artistic, colourful, and geometric shaped light but this was not always the case. When I was first starting out as a photographer, I, like many, found myself drawn to those hazy and dreamy flare filled images but when I tried to capture images filled with flare I found my captures were often wash out or my flare overpowered my main subject. Whether you are embracing the gorgeous artistic enhancement of lens flare or want to eliminate it knowing how to control lens flare is your first step. Here are a few secrets to controlling and mastering lens flare. To help you better understand lens flare let me briefly and simplistically explain what it is. Lens flare is simply light. When a photographer captures an image, using a digital camera, light hits the camera sensor triggering electronic signals that then turns the light into an image. However, sometimes, in certain lighting situations, there is light that refracts or reflects inside the lens. This light shows up in various forms of flare depending on the lens type, lens settings and how that light is refracting. The first point of control when it comes to lens flare is in your gear. That hollow circular part that attaches to the front of your lens is your lens hood and it can be very effective in controlling and even eliminating lens flare. Lens hoods help block or minimize the amount of light entering the lens which will help reduce or control flare. Now if your goal is a lot of haze or lens flare then by all means remove your hood and let the light in! Lens choice matters when it comes to flare management. Wider angle lenses are often build to handle more light entering the lens and can sometimes manage flare better when compared to telephoto lenses in the same light. More expensive lenses often have an anti-glare coating which can help reduce flare. Prime lenses or fixed focal lenses also tend to control flare better because there are fewer internal parts in which light can bounce off of. My favourite lens for capturing lens flare is my Nikkor 105mm 2.8f. It’s dreamy every single time. This may be obvious but the type of light you use will impact the amount of flare in an image. Direct backlight is going to result in more flare than shooting with your back to the light source, which will likely almost eliminate most flare. Side lighting will result in different flare than backlight. A high light source will result in less flare than a light source that is low and directly shining into your lens. Filtered light will typically result in less flare than full unfiltered light. Be aware of what type of light you are working with and conscious of how that light source will impact potential flare. This point is similar to the last except it’s not the type of light you’re using rather it’s your own position to the light that is important. Small movements can make a big difference in managing lens flare. I often take several shots of the same scene making small movements up, down, right or left so that I can choose how much or how little flare I want when I’m in post processing. Closing down your aperture (f9, f13, f22) will result in less light entering your lens and less lens flare. Most often you can create a sun burst at these apertures especially if the rays of light are being dispersed by an object. A wider aperture (f2, f2.8, f3.2) will result in more lens flare because more light is entering you lens. Also, this type of flare is often more hazy and less defined when compared with apertures like f9, f13, f22. Yes! I’m all for it! My love of all things creative runs pretty deep. I admit that indeed I do use flare overlays to add and enhance flare in post processing. As long as the flare works with the type of light in the image I will often incorporate an overlay to enhance already present flare. I enjoy being creative so this type of editing works with my style of photography. If you are subscribed to my website I sent you a spring gift so check your inbox! Did you get it? My spring gift to you is a sun flare overlay, which I created specifically for those subscribed to The Photographer’s Notebook! I used the flare in the image above. Enjoy using the overlay to enhance the flare in your images. If you are not subscribed to my website you can pick up the flare by subscribing, but do so before April 30, 2019 because this gift disappears after that date. There are many different reasons photographers pick up the camera. It could be to document a moment and preserve a memory or perhaps to create art, or maybe it’s a combination of both, or perhaps photography is a business for the photographer? Regardless the reasons behind why a photographer captures an image I wager a bet that there is a subject in the photographer’s frame. Capturing an image in a way that draws attention to your subject will create stronger more dynamic images. Here are four elements that I use in order to draw attention to my subject. Light is hands down one of my favourite elements in which to bring attention to my subject. The power of light is undeniable. Thinking about how you can light your subject in a way that makes him or her shine is a sure way of drawing attention to your subject. Composition is an in depth topic. It’s vast theory is extremely powerful and can help draw your viewer into your image towards your subject, can help lead your viewer’s eye through the frame and can help tell the story you intend through your images. Two favourite compositional techniques that I often use which draw attention towards my subject are framing and filling the frame. Fames are a very effective way in which to define your subject within an image. I enjoying looking for and finding all kinds of frames and I love creating them too. There are many types of natural frames outdoors such as trees or even grasses. There’s also artificial frames which can be structures like bridges or park equipment. When I’m outdoors my favourite kinds of frames to find usually involve something sparkly. I enjoy shooting through shrubbery which creates that frame I want but also adds a touch of sparkle magic into my images. A second way composition can be used to draw attention to your subject is to fill the frame. Filling the frame ensures that your subject is front and centre within the image. Distractions are often completely eliminated and there is nothing else to focus on but your subject. When we view an image our eyes are typically drawn to areas of focus. Our brains tend to feel more comfortable with in focus aspects of an image and will be drawn to areas of focus before exploring out of focus areas within an image. The use of purposeful and selective focus can help draw your viewer’s eye into an image and towards your main subject creating impact. Colour is a high attractant and will almost always draw attention towards your subject especially when that colour is bright and bold against a more neutral background. I use this technique often and have a collection of bright and colourful accessories and clothing for my children. These are only a few ways in which a photographer can draw attention to a subject. There are many more. In fact, I think in the future I’ll write under this topic again with different tips! Now that winter is over, so says the calendar. (I’m choosing to ignore the snow that remains and is all too slowly melting away). I’m ready to capture all things spring! I always enjoy some inspiration so here are a few of my very favourite spring elements to incorporate into all my images. I think winter is beautiful. I adore the fluffy white snow and sleepy frozen landscape but it gets cold here, very cold, often so cold it’s hazardous to venture outside for any longer than a few minutes so come spring we embrace our outdoor adventures enthusiastically. I wager a guess that, like me, you have been heading out into nature more. I love going for walks along our city pathways, venturing into the woods and parks, playing down by the river and stopping in at the park. These adventures all make for fantastic opportunities to capture everyday moments of childhood in a genuine and authentic way. With spring comes new life. I’ve already seen green grass sprouting up through the thawing winter earth so I know it won’t be long now and the flowers will begin to bloom. Fields of flowering weeds, dandelions and flowering trees all begin to blossom over the next few months. I adore infusing the colour spring flowers have to offer both into my child images and landscape images. Spring is about new life. I’m certainly partial to the earthy smell of moist soil and green growth and I enjoy watching my children nurture tiny seedlings that will eventually be transplanted outdoors but for now need tender care and attention. I don’t know about your children but mine adore bugs. Wiggly, squishy, fast, slow, slimy, hopping…all are excitedly scooped up and gently played with. I treasure these childhood moments because there’s so much joy found in such a simple everyday moment. When my children were a little younger we used to visit a local farm around the Easter season. I have many capture of them petting the baby goats and holding tiny baby chicks. All wonderful sentimental moments that I cherish to this day. Spring is truly about the full four seasons for us. Snow, rain, fog, sun we get it all. I enjoy the variety these weather elements offer and aim to incorporate weather into my spring images from both outside and inside. Our spring vacations can range from sun and beach to snow and ice and somewhere in between. Holidays are always inspiring and I want to capture all the images all the time. Outside of everyday routine I always find myself inspired by scenes and the newness of my surroundings. Winter where I live is either white and pretty or dried brown bland so I fully embrace the colours of spring. The brighter the better! I love to capture nature’s beautiful colours but I also embrace colourful clothing and accessories too! I find beautiful colour so refreshing and rejuvenated after a long white colourless winter. Have you picked yourself up a Photographer’s Notebook yet? Take 5 minutes or so to brainstorm some spring themed images after reading this post! Jot down your ideas for images you can capture and be inspired to capture all the beautiful moments spring offers because this season often moves on in the blink of an eye! Happy spring friends! Winter is certainly sticking around up here in the Northern Hemisphere where I live. Although most have made it through the majority of winter, if I’m being honest as opposed to optimistic, I know that we will not see signs of spring, outdoors, until about late April early May. However, signs of the coming spring are abundant inside my home. Once February arrives I begin to see new light in my home that disappeared during the darkest of the winter days. I get really excited this time of year discovering new light and using it in fun and interesting ways. For those of you who know me as a photographer you will know that I’m incredibly passionate about light. I especially enjoy watching light move and change throughout the seasons inside my home. It’s like a little gift. As spring approaches and I begin to see the significant and dynamic changes within the light inside my home I begin to ponder how I can push my light use it in a creative way. Here are some of the types of light I like to look for and use within my home. In its most basic form natural light found indoors can fall into two different categories: Soft or hard light. If you are new to the study of light, soft natural light can be defined as light that generally has a softer transition from highlight into shadow. If there is no clear definition between lightness and darkness the light is defined as soft. Soft light can be used in many different ways inside your home and is probably the most used light. I also think that soft light is often easiest to photograph. Hard natural light can been seen in situations where there is a distinct line between a highlight and shadow without a smooth transition between the two. I really enjoy playing with hard light which can bring unique and fun patterns into a scene. Patterned light is one of my favourite types of light. It can result from both hard and soft light but is very often hard or towards the harder side of soft in nature. I think it’s really creative light and can be used in all kinds of ways to add drama or unique interest into an image. Capturing a sunburst or sun flare adds gorgeous dynamic light into an image. A sunburst and sun flare can be found and captured when the sun is directly shining in through a window. You will most often see hard light in your home when there is the possibility of capturing a sunburst or sun flare. It’s easiest to capture that burst or dispersion of light rays when the sun is being filtered through or hitting an object such as the side of a window frame. This helps disperse the light creating that sunburst. Flare will occur when the light enters the lens and can be controlled with small movements in your positioning. A sunburst and sun flare can occur together or separately. Silhouette isn’t as much a type of light rather it is how a photographer uses the dynamic range within a scene but I think it’s worth mentioning. Silhouettes are a beautiful way to highlight a profile or enhance a mood within an image. A tip here is to try and have your subject’s limbs separated from his or her body so that there is definition and your subject doesn’t become a black blob. Here’s a little challenge for you this coming week! I’d love to see you find these types of light situations in your home and then shoot for them! Actively noticing the light in your environment will help you understand light better which in turn will result in you becoming a stronger photographer! Another tip is to pull out your Photographer’s Notebook! Have you picked one up for yourself yet? Study the light inside your home and jot down notes about what you see! This will help you not only learn about the light in your home but you’ll know where to go when you want to use a certain type of light in a creative way! I’ll admit it. I’m extremely fortunate to have, for the most part, cooperative subjects to photograph but trust me it’s not always this way. I also have two preteens and as they age their opinion in how I photograph them in addition to their compliance plays a role in how and when I capture them. I am also not a documentary photographer. Yes, I enjoy capturing everyday moments but photography feeds my creative soul and because of that I have a need to capture everyday moments within my creative vision. Sometimes I’m a little more relaxed with my vision for an image but sometimes I do aim for a specific outcome. 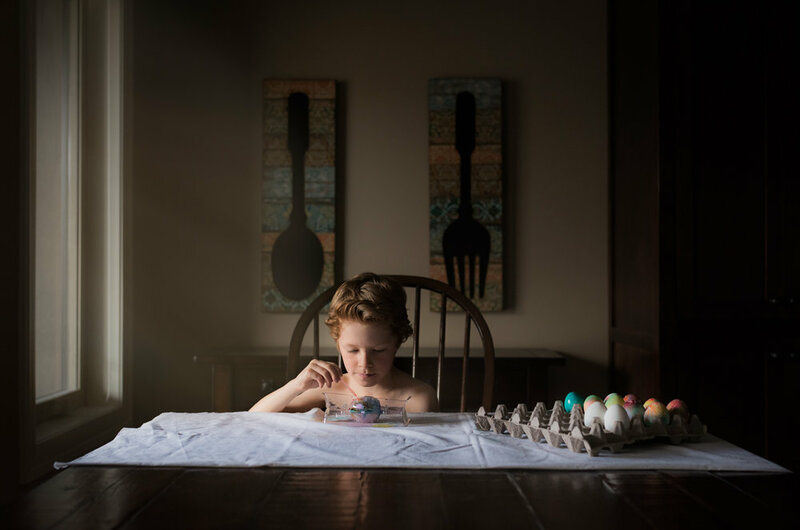 Over time I’ve learned a few tricks and tips that help me achieve the images I want and allow for my children to have fun with my photography too. I’m often a vision focused photographer. What this means is that I have an idea in my creative mind about what or how I might like to capture a memory. Before I even ask my children to participate I set up every single detail from light manipulation to creative props to camera settings and so on. I’ll even take a test shot to ensure my settings are spot on and that I’m on the right track for what my vision is. Only after I’m completely ready will I ask my little subject to pop into the scene. I quickly snap away and get what I want within a few short minutes. For example, in the image below I knew what I wanted to capture and how. I was completely set up and prepared before I asked my daughter to start twirling for me. She only twirled a few times before I knew I had what I wanted. This ready beforehand and short photo shoot session makes it fun and easy on everyone. In addition to making any planned photo shoot short and sweet I also try to come up with fun photo shoot ideas. I find things like movement and play are openly embraced by my children. I also know that almost any type of outdoor play will be welcomed by my children. Outdoor adventures are always the most fun and easiest moments for me to capture. Also, if I incorporate an idea that is mildly dangerous to me or entertaining for my children I know my children are bound to participate. For example, my son loves to throw snow balls at my camera lens! I just make sure I stand far enough away out of full impact reach! I prefer longer lenses anyway but I find the use of a longer lens important when my children are just not quite in the mood to be photographed. Outdoors, I use a long lens pretty much exclusively. This allows for my children to run and play and be themselves while I can maintain distance and hang back a little. My longer lenses also allow for me to experiment creatively with things like light or composition or even creative additions into an image like a prism. I use this often with my children. I let them know that I’d really like to photograph them and tell them that they get to come up with what we do. For example my daughter has been working really hard at reading and I told her I wanted to capture this milestone. I asked her to plan the shoot in her room. When I showed up she had all these sparkly crystals she’d found that she wanted me to use. She willingly participated in the photo shoot and I captured that milestone image I wanted. She was super excited to see how her idea of the crystals came out in the final image. This is similar to the above point but different. I almost always have my camera with me but there are times when I actually don’t feel like picking up my camera. I remember a particular hike we were on last summer when we came upon a field of beautiful fox tails. I was feeling disappointed about the smoke from forest fires ruining the mountain view but my oldest was extremely excited about running and playing in the field of fox tails. As she was playing she asked if I was going to photograph her. I remember not feeling all that interested in picking up my camera but I did because she wanted me to preserve that memory for her. Looking back now I’m glad I have those moments captured. When they ask for an image I always make an effort to do just that. I find if I ask my children to do something that they love that they’ll be way more cooperative as subjects. My oldest adores going to the park to feed the Chickadees and Nuthatch. These little birds will actually fly right up and sit on an open hand. Yesterday, she asked to go to the park and when I agreed she got herself ready, without any prompting, in a winter coat, toque, matching scarf and her more attractive boots…all items I’d be thrilled with photographing her in. “It always goes like this when we actually plan a photo - I end up loving the photo that I just randomly took for fun before we took the “planned” photo! I’ll never tire of real and authentic shots. To me they tell a story, like this beautiful one of my amazing little girl who has the biggest heart of all.” Amy Louise. What Amy Louise had to say completely resonated with me. I love portraiture. That beautiful soulful connection with the camera in a gorgeous well lit pose is captivating to me. However, my children have zero interest in standing a certain way to allow for light to fall in the perfect Rembrandt Triangle while staring deep into my camera. I’ve tried this. It doesn’t work out well. This feels rigid and uncomfortable for them and can be frustrating for me. I’ve learned to let go of having this expectation and instead aim to capture a relaxed portrait. I adore these types of portraits even more and the authenticity that comes from images like this. In a relaxed portrait personality shines through and these are always the images I love the most. Yup, I do get that look. The rolling eyes, the intentional defiant expression, the “I’m not going to look pretty on camera” glare, the “There’s no way I’m participating” pose. In these situations I switch directions and focus in on details. For example, my son did not want to be photographed prior to me capturing this image. He was giving me the frozen eye roll glare. However, he’d found a rock that was shaped like a bear and when I suggested we capture that detail he was all in. Sometimes putting down the camera is the best answer. I want my children to feel like participants in our photo shoots and enjoy my camera too. So if they are truly not in the mood I put my camera away. After all, there will always be another opportunity. When I first began my photography journey I made a lot of mistakes. That’s okay, really! I truly think a person learns from making mistakes. A person can also learn from information and so I’ve gathered together some of the mistakes I made as a new photographer to give you a little food for thought. This is probably the biggest mistake I made when I jumped from shooting in auto to manual mode. I didn’t quite understand the importance of a fast enough shutter speed. Shutter speed controls motion in your images so it’s really important to ensure that you maintain a fast enough shutter speed to freeze not only the motion of your subject but your own movement as you capture your image. Rule of thumb when it comes to shutter speed is, try to keep that shutter speed above 1/160 if your subject is very still, like asleep still. Personally, I do not like to set my shutter speed below 1/200 and prefer 1/250 if I have a still subject. Now when it comes to a moving subject I like to keep my shutter speed at least 1/800. I prefer to go higher if I can. Now having said that playing around with shutter speed can be extremely fun and will introduce creativity into your images. You can try panning and other creative slow shutter techniques, like long exposure, as a means to feed your creativity. Here are two examples of shutter speed. In the first image, the shutter speed was fast enough to freeze her motion and the movement in the drapery. In the second image, the shutter speed was slow which blurred the movement in the water and clouds in the sky. A tripod is a necessary tool when capturing long exposure landscape images. I remember purchasing my first pro lens. I saved my pennies and bought a Nikkor 50mm 1.4. I was really excited that I could now open up my aperture to 1.4 and so I did that. At the time I did not understand the relationship between aperture and depth of field. Aperture significantly effects depth of field. Depth of field is what is in focus or how big your slice of focus will be. Another factor that impacts depth of field is how close you are to your subject and your focal length. I’d open up my aperture to 1.4 and then I’d shoot a close up of my subject. I didn’t understand why my subject was not fully in focus and why only one eye or half the face was. I understand now that a large aperture (f1.4) will have a small area of focus and a small aperture (f22) will have a large area of focus. Now shooting wide open has a purpose and is a wonderful creative technique to use when you want a small slice of focus to bring visual attention to only a part of your image. One of the reasons I was shooting at an aperture of 1.4, when I first started, was because I was concerned that a higher ISO would ruin my images. Yes, it is true that a higher ISO will add some noise, or a grainy texture, into your images however noise is always preferred over an out of focus or blurry image due to a poor choice in aperture or shutter speed. There are noise reduction options in post processing that can really help reduce noise. I often shoot at ISO 2000 or even higher in low light in order to ensure I make good choices about my exposure triangle. I had a big moment of learning when it was brought to my attention that there is a significant relationship between light and mood. I’ve always been fascinated by light but it was a long way into my photography journey before I understood that light impacts mood. Brightly lit images are more likely to evoke happy and energetic moods while low light is more likely to evoke peaceful or tension filled moods. It’s not only important to find and use good light within your images but it’s also important to think about the mood within the light. A smiling happy child might seem out of place in a low and minimal light situation. Actions and presets can be incredibly useful in post processing. They can help a photographer cohesively edit a series of images, maintain a style and speed up workflow. However, very often actions are not one click and will likely need some tweaking. It is best to learn what an action or preset will do to your SOOC (straight out of camera) image before using it. It is also best to tweak most actions and presets. Gear does not make a photographer. It is the photographer that captures the image. Don’t get caught up in thinking that a different camera or a different lens will make you a better photographer. Practise and learning the technical side of your camera is more valuable than any new gear. A fun creative exercise to try here is to use a different lens then you’d normally choose in a situation and see what you can come up with! Putting yourself out there is really hard. I understand this. However, asking for critique will help you learn and grow as a photographer. Take the advice or leave it. It’s up to you. Being open to the opinion of another photographer can certainly help you see differently. Theodore Roosevelt was absolutely right when he said, “Comparison Is the Thief of Joy". Comparing inhibits you from infusing yourself and your own unique artistic vision into an image. It’s impossible to create an image just like that of someone else. In the end you’ll only be doing yourself harm if you compare. Capture what you love in your own unique and beautiful way.